Rcoupon is a browser add-on that promises to help you save money while shopping online. Loads of other adware applications are marketed in this manner and just like others Rcoupon will not do what it obliges to. Dubious third-party advertisements and annoying pop-ups are all that Rcoupon provides users with; thus, making surfing the web a bothersome task. But that’s not all; usually adware programs are related to various internet-based infections. Running Rcoupon, or any other adware application on your PC increases the chance of infecting your system with some malware significantly. Removal of Rcoupon is a must in order to retain your system clean and secure. Virtual security tips and removal instructions are provided within this report. Since Rcoupon is based on the JustPlugIt engine it is no surprise that it functions in a similar manner as its counterparts based on this engine (Maccouponfinder, Les2Pay, Lucky Coupon, ExstraCoupon, King Coupons, etc.). As soon as Rcoupon enters your PC it will install browser extensions to Mozilla Firefox, Internet Explorer, and Google Chrome. Fortunately, an updated version of Google Chrome automatically disables the extensions. Unfortunately, that might not stop the adverts, and annoying pop-ups displayed by Rcoupon. The only way to stop the invasive activities for sure is remove the adware program completely. What is more alarming than the annoying activities is that these adverts ad pop-ups could turn out to be malicious. Rcoupon could present you with a fake pop-up message urging you to update your Flash player. You should know that the actual Flash player updates itself automatically. Often such fake updates are used to install malware onto your PC. Avoid any pop-ups urging you to update anything on your computer. If you suspect any software being outdated visit the official developers’ website and see if any updates were issued recently. Do not risk infecting your system with unknown malware and remove Rcoupon without hesitation. Because the direct download link on the official website does not working, it is safe to assume that Rcoupon is distributed via bundled software. Often users obtain installers stuffed with dubious applications from dodgy third-party hosting websites. Avoiding them will certainly lower the risk of infecting your system in this particular manner. Download software from official developers’ websites only. Furthermore implement a trustworthy antimalware tool to safeguard your PC against any other infection. It is paramount to remove Rcoupon from your system as it could be used as a gateway by other internet-based infections. Use the provided instructions below to remove Rcoupon. It is important to note that sometimes removal via Control Panel does not delete the infection entirely. That is why we provide a list of files, folders, and registry entries linked to Rcoupon. Check your computer for potential leftovers by using this list. 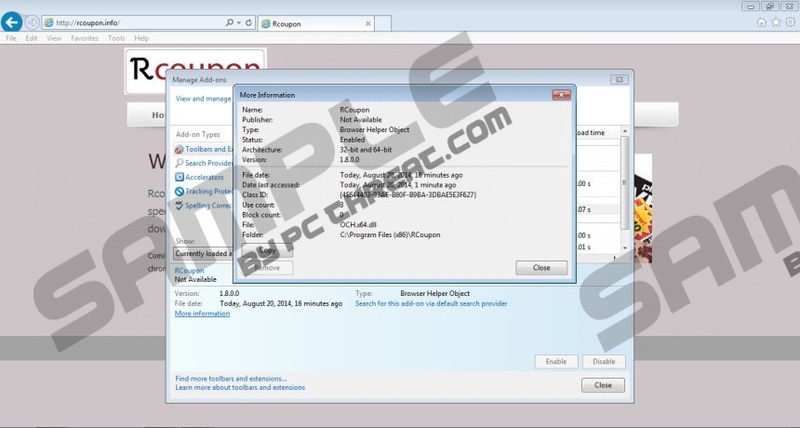 Some users might find it hard to analyze the system for traces of the infection that is why we advise you to use a reliable antimalware program to terminate Rcoupon or any other invasive application. Tap the Windows+R keys on your keyboard. Now type Control Panel into the text box and click OK. Select Rcoupon and click Uninstall. Tap Windows+Q keys on your keyboard. Now double-click Rcoupon to remove it. Now select Add or Remove Programs. Quick & tested solution for Rcoupon removal.